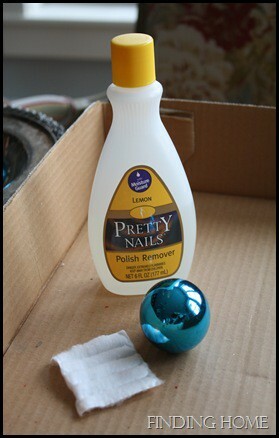 Add a little nail polish remover to the paper towel and lightly dab at the ornament till you get the effect that you want. When you first start dabbing it only takes off the shine and then a little more dab and it brings it down to the silver. Try to be patient and just lightly dab. It looks more authentic that way. If you wipe instead of dab it starts to sort of “smoosh” the finish which can then lead to peeling which is not so great. This is the look that you should get.